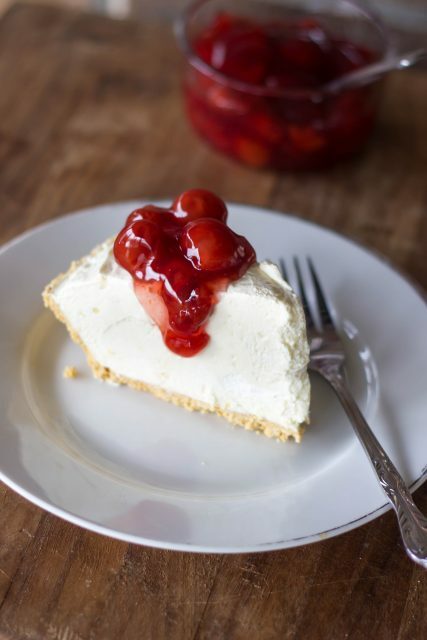 I’m a huge fan of the Philadelphia 3-Step Cheesecake that I posted on the blog a few years ago. 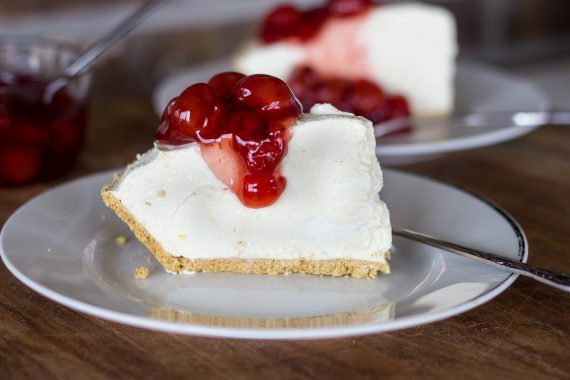 It’s one of the first recipes I started making by myself and it’s pretty much the perfect, easy, classic cheesecake recipe. BUT….sometimes, I want cheesecake faster. I don’t want to wait for it to bake and then cool and then chill. You too?? I mean, the chilling of cheesecake is kind of unavoidable, even with no-bake cheesecakes but at least they can chill down faster! And if you stick them in the freezer, you can have cheesecake even faster ;). (I mighttt have done this haha!). Seriously the easiest cheesecake ever and while maybe not quite as good as the Philadelphia 3-Step Cheesecake, it’s really, really good! Enjoy! 1. In bowl of stand mixer with paddle attachment, beat cream cheese until smooth. Add in powdered sugar, lemon juice, and vanilla and beat until smooth. 2. Fold in whipped topping. Pour into graham cracker crust. Cover and let chill in the fridge for several hours or overnight before serving. 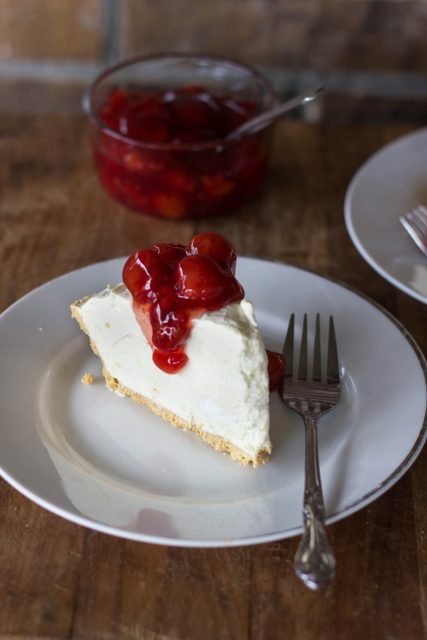 (Place cherry pie filling in the fridge to chill too.) Top with cherries. Serve!